We had a wonderful Christmas Eve filled with fancy dresses, church service, family time and flying wrapping paper. 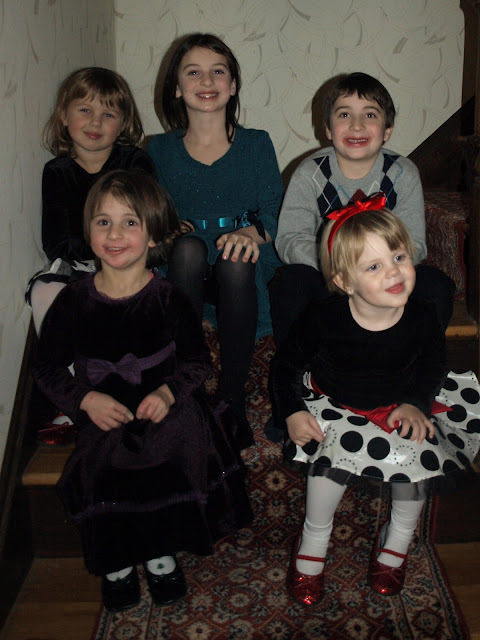 The girls happily modeled their Christmas dresses that they had received from Nanny (their Great Grandmother). We set the timer and tried for the family photo. I commented for yet another year that I couldn't believe I still hadn't invested in a tripod. This year I added a remote camera clicker to my list of "I really should get..."
This year I made do with an end table, a cardboard box, and the camera auto timer set to 12 seconds. Next year... our family pictures will be taken with a small tripod. (A package was under the tree "from Ana") But, I imagine I'll still be saying "I can't believe I never went and got a remote." We went out for a nice early dinner and then headed to church for the Christmas Eve service. The girls and their cousins behaved remarkably well for and evening service. A LONG evening service. 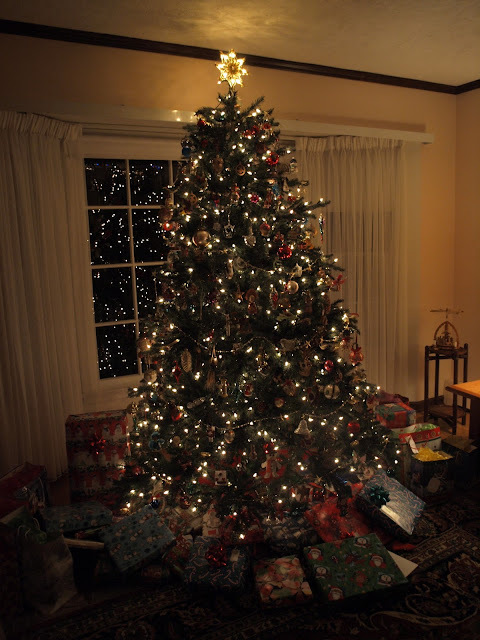 Grandma and Grandpa's tree looked lovely. I tried one more time for the perfect cousins photo. Almost. Do all 8 year olds think it's fun to make faces like this in pictures? 6 pictures by the tree and this was Larisa's best face. 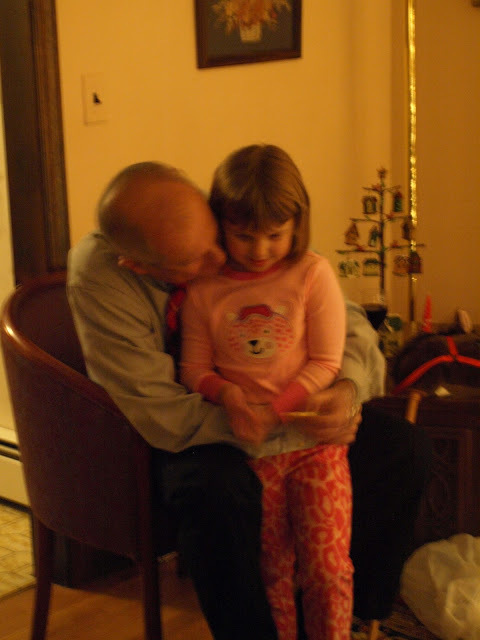 I caught a sweet (but blurry) moment of Grandpa and Zoe. Moments later chaos ensued. I don't think I could tell you what presents were openned even if my life depended on it. Fun was definitely had. We ended the evening with this rather miraculous event. 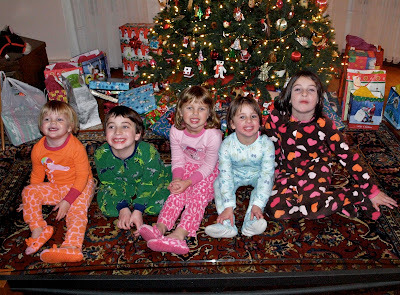 5 children (aged 8, 7, 5, 3, and 2) all sat down with one activity. No adults aimed them in this direction. They just grabbed Nina's bendaroos and situated themselves on the round rug. There was quiet and concentration. Bendaros may just be made of magic.